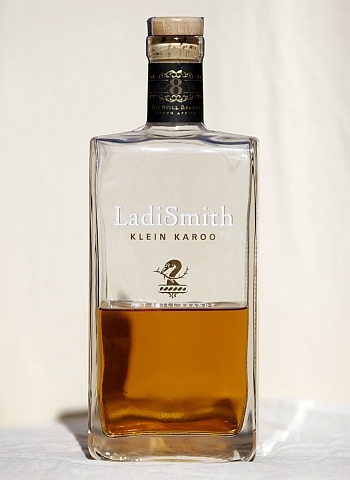 Ladismith Klein Karoo 8yr from the stunning R62 brandy route. Aged 8 years it shows maturity beyond its years, as is illustrated by its most recent gold medal at IWSC 2011. My rating: 19/25. Palate: Cinnamon, sun dried apple. Apricots, , wood and strong vanilla. Cant get the jasmine though, not for lack of trying! Very soft finish, not quite as smooth though as some of the older more mature brandies. Still no roughness or burn on the swallow. Lingers on the palate long after swallowing. Neat in a snifter. Because it is younger and zestier, it can be enjoyed more informally over evening chatter and conversation. A very social premium brandy. But be careful, it slips down very easily!